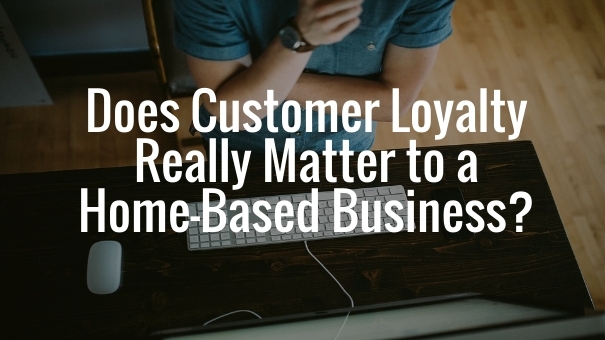 Does Customer Loyalty Really Matter to a Home Business? Home | Marketing | Marketing Strategies | Does Customer Loyalty Really Matter to a Home Based Business? The short answer is yes — of course it does. Customer loyalty is an asset every business should develop, whether they’re part of the Fortune 500 or based in a home office. Why? It’s simple; loyal customers do more that just supply repeat business — they also provide valuable word-of-mouth advertising. Unfortunately, customer loyalty can be challenging to both build and measure. Factors such as pricing and convenience may be partly responsible for repeat sales, so it’s important to determine why your customers are coming back before you assume that they are truly loyal. Customer feedback points out what you’re doing right, and also provides ways for you to improve your products and services. It also shows your customers that you care what they have to say. If you go so far as to implement their suggestions, they may even develop a sense of ownership in your business and become more loyal to your company. If your service falls short and a customer wants a refund or adjustment, act quickly to correct the problem. You need to do more than just apologize — actually resolve the problem in order to make a connection with your client. If your customers have a difficult time finding a solution to their problem, they won’t be saying positive things about your business to their friends. However, if you view each customer complaint as an opportunity to build a stronger relationship, deliver cheerful and prompt resolutions, and show genuine concern, customers will come back time and again, regardless of their previous troubles. There’s something inherently nice about a sincere thank you — and customers are rarely expecting it. Take a little time to send a handwritten thank you note to your customers to let them know that you genuinely appreciate their business. They’ll remember your thoughtfulness when recommending your business to others. It’s also a good idea to reward customers who make referrals. Freebies, discounts, or small gifts will boost loyalty and encourage them to spread the word. Furthermore, you’ll have a convenient way to measure the effect of word-of-mouth advertising. Remember birthdays, anniversaries and other special occasions; offer up a gift or discount if you’re feeling especially generous. If you’re among the few who remember a customer’s special days, they’ll never forget you. If your customers are local, consider getting together over coffee or lunch. Ask about their family, hobbies, and other important aspects of their life. Take the time to get to know them in a non-sales environment. The plain truth is that it takes far less time and money to sell to an existing customer than to a cold prospect. By listening to customer feedback, expressing gratitude when it’s due, and connecting on a personal level, you can build loyalty that not only keeps customers coming back, but also results in a steady stream of referrals.